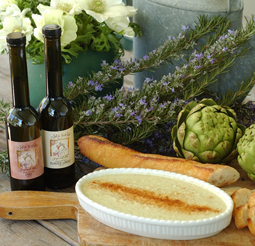 Artichoke Dip - A recipe from Savor California, the online showcase for extraordinary gourmet foods and beverages from California. Drain artichoke hearts, reserving at least 1/2 of the liquid from the cans. Mix the first five ingredients in blender. Purée briefly (add artichoke liquid if too thick). Place in ovenproof serving dish. Lightly sprinkle paprika on top. Bake for 20 minutes until bubbly at edges. Serves six as an appetizer. Also great as a spread on a mozzarella and grilled veggie sandwich.